The global enterprise labeling software market will post a CAGR of close to 6% during the period 2019-2023 (Photo: Business Wire). Enterprise labeling facilitates the linking of the labeling process with various business operations. The integration of enterprise labeling software delivers benefits such as enterprise-level data collaboration, supply chain efficiency, adherence to regulations, and labeling consistency while providing the required flexibility in label printing. Furthermore, enterprise labeling software helps maintain accuracy during the printing process as accuracy is one of the factors that ensure the compliance of companies with product information disclosure regulations in their respective end-user segment. Thus, the rising requirements for enterprise labeling to streamline various business operations are expected to support the growth of the market during the forecast period. As per Technavio, the increasing demand for dynamic labeling will have a positive impact on the market and contribute to its growth significantly over the forecast period. 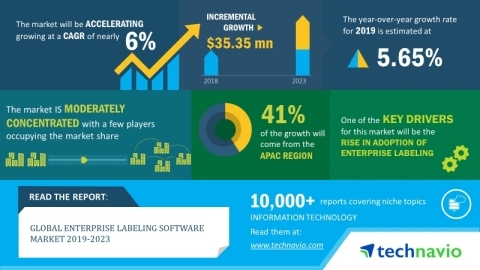 This global enterprise labeling software marketresearch report also analyzes other important trends and market drivers that will affect market growth over 2019-2023. With dynamic labeling introducing agility in the enterprise labeling process and enabling manual changes and updates to the database accordingly, its demand has significantly risen over the years. These updates using enterprise labeling software streamline the label formatting and printing processes by managing the regional, language, regulatory, and customer-specific information on the labels, which also reduces the inconsistency-related risks in labeling. Moreover, dynamic labeling also enables easy color labeling. The use of color labeling facilitates compliance with regulatory policies as well as differentiates the products. Thus, a rise in the demand for dynamic labeling is expected to fuel the adoption of enterprise labeling software, during the forecast period. "Apart from the increasing demand for dynamic labeling, the increase in adoption of cloud-based applications is another factor that is expected to boost the growth of the global market. Cloud-based enterprise applications is propelling the demand for cloud-based labeling applications as they offer many advantages, including a reduced upfront cost for software ownership, zero maintenance and support costs, lower integration complexities, and the flexibility of the pay-as-you-go model. Thus, such solutions allow businesses to focus more on their core operations instead of worrying about increasing their IT overhead costs," says a senior analyst at Technavio. This market research report segments the global enterprise labeling software market by end-user (FMCG, retail, healthcare, warehousing and logistics, and others) and geographical regions (APAC, North America, Europe, MEA, and South America). The APAC region led the market in 2018, followed by North America, Europe, MEA, and South America, respectively. During the forecast period, the APAC region is expected to continue dominating as well as register the highest incremental growth due to a number of end-users investing heavily in enterprise labeling software in the region.